Throughout my career as a protestant pastor I followed, with interest, the life and ministry Pope John Paul II and Mother Teresa of Calcutta. While on a short-term mission trip to Rome, Italy – I stopped by St. Peter’s to pray for Pope JPII. In addition, I used the documentary of Mother Teresa’s life as a tool to train short-term missionaries on the meaning of selfless service. At the end of Pope JPII’s life I followed the funeral proceedings, conclave and the election of Pope Benedict XVI with great interest. To this day I am not sure why I was so interested except to imagine that my process of conversion was already developing. I cannot underestimate the impact Pope JPII and M. Teresa had on my life. However, I do want to emphasize the idea that Pope BXVI is the only Pope I have every really known – as a Catholic. For this I am truly grateful. Pope BXVI has been fun to watch. Because of my relative youth as a Catholic convert, I haven’t watched Pope BXVI through the lens of past political fights, the challenges of implementing Vatican II & its aftermath, other scandals or intrigue that the media loves to speculate on. Not that I am ignorant of the history of the Catholic Church, its sin, scandal and the many challenges this institution has faced over the past 2000 years. Yet, in my newness I have come to appreciate this particular Pope, having a Pope and all the benefits this office brings to the Catholic faithful. Immediately upon our conversion, Heather (my wife) and I appreciated several things about the Papacy – one of them being the idea that in it we have a Shepherd that is charged with carefully watching over the spiritual needs of the sheep. As I reflect on John 21:15-19, Pope BXVI has done a masterful job at feeding the sheep. Between his first encyclical Deus Caritas Est (God is Love – John 4:16) and his now famous trilogy on Jesus of Nazareth this Pope has brought the Church back into an embrace of Christ or its natural Christological center. As a convert from Protestantism, this has been music to my ears. In addition to this, Pope BXVI has called the Church into the Year of Faith (a time of personal & corporate renewal) and encouraged us to fully embrace the New Evangelization (beginning with P. Paul VI, JPII & continuing with PBXVI). If that were not enough (& I only scratched the surface) he has also carried on a dialogue with the Eastern Orthodox, opened up the doors for our Anglican brothers / sisters to join the Catholic Church and has spoken eloquently on the challenges the Church faces in a post-Christian society. In addition, this Pope has embraced social media (@Pontifex – Twitter) and has challenged a new generation to the two-fold task of embracing technology for the sake of the gospel while centering oneself through the discipline of contemplation. A wise bit of advise in a speed obsessed culture. Abdicating the Office of Bishop of Rome – Successor of St. Peter. Finally I want to talk about the way PBXVI decided to abdicate or retire. Having made this decision, he leaves the seat of supreme influence as head of the Universal Church during the season of Lent. Just as Jesus was baptized and went into the desert alone, to be tempted and to overcome, so too does Our Pope follow in the footsteps of Jesus. By retiring now, Pope BXVI walks into the desert alone so that we may emerge from our Lenten sojourn celebrating Easter with a new Pope – a Shepherd that will lead us deep into this springtime of the Church. This springtime is the fruit of the New Evangelization, Year of Faith, and a renaissance of tradition that represents the deep roots of the Catholic faith. May God Bless His Holiness, Pope Benedict XVI, his successor, the Catholic faithful and the whole of the Christian community. It’s comforting to read this post about the blessings bestowed upon the Church by God though the Holy Father. Thank you for sharing. I converted last Easter, and I feel similarly. 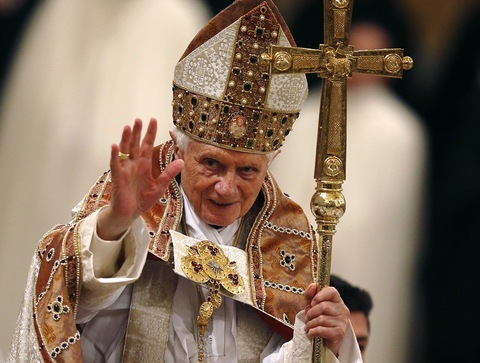 Pope Benedict XVI has served the Church well. Too cool that you converted. I hope you are enjoying the journey. God Bless. Thank you for sharing your story and your hope for all of us, the whole world. Thank you for reading. Our hope is in Him – Christ the Lord. I converted while John Paul II was pope. He was wonderful. And I treasure Benedict XVI. How fortunate to have two such holy men. Would that all Catholics followed in their spiritual footsteps. Only thing that matters is Christ, Regardless of Denomination, however I have been learning some things about the Catholic Church that i never knew before and it has been a interesting journey. I grew up a Pentecostal and i have spent the last few years investigating many of the Churches and I still can not get any proof about Peter ever being in Rome or being the first Pope! I have read arguments from both sides and i still can not make up my mind!!!!! The Catholic Church houses the bones of St. Peter beneath St. Peter’s Basilica which is in Rome. What does that tell you? Yes, I had the very good fortunate of visiting Rome and the Vatican, in February 2012. The place that I felt that the Holy Spirit was speaking to me was at that very place, the tomb of St. Peter. I was brought to tears. It all came together for me. David, Keep studying and reading with a heart set on learning the truth. If you do that, one day you will convert and will thank God and Mother Mary for doing so. WAS ST. PETER EVER IN ROME ?? The Catholic Church is not a “denomination”. It is the one true church established by our Lord for the salvation of men. Until you accept that you will forever be searching and listening to arguments from those who deny this truth. As for Fr. Ratzinger, his departure during his “year of faith” is kind of telling, isn’t it?? Thank you for taking time to read and comment. However, just a note to remember. Fr.Ratzinger and his life was submitted to the will of the H.S. and the Church 8 years ago when he became Pope. 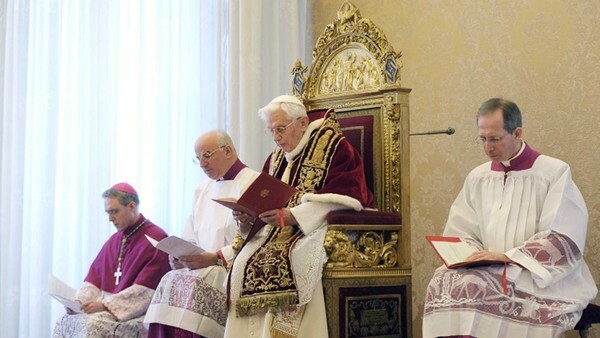 Now we lovingly refer to him by his proper title according to the Vatican, “His Holiness Benedict XVI.” We are all just trying to have a conversation, explore the truth of Christ & the Church from multiple vantage points. Finally, BXVI’s departure was true to what he originally stated when he became Pope. If there would ever be a time when he did not have the mental or physical strength to be Pope – he would retire. He did what he said he would do and what the law of the Church allows for. Let your Yes be yes and you No be no (Sacred Scripture). Glad to see you are on the journey. Those of us in the Church that Jesus started cannot believe that those outside of her do not understand or believe truth. All of them are Mall shopping from reading the Bible. We love them and pray for them. And hope they pray for us. I did not comment to be argumentative. The Church did not start after Vatican II as many believe. Would you still have become a Catholic in the pre-Vatican II Church? Look up the word Modernist as defined by the Church and study What Pope St. Pius X had to say about them in Pascendi Dominci Gregis, September 8, 1907. Just a note for you to hopefully ponder and remember. I hope you find the Catholic Church in your heart. Thank you for sharing again. Since I was born in 1972 it is hard to answer your question. I came into the Church because I believe Christ called me to come home to the Catholic Church. What I say about Vatican II is that it is a valid council and its documents are to be considered in that light – just as we ought to consider the councils before it. I am not overly worried about the word modern since we are now living in a post-modern world and ought to be considering how we live in the space in which we find ourselves. That being said I will look up the word modernist as defined by VII and will also look at Pascendi Dominci Gregis. PS Thank you Mr. Eneubauer for you blog, very insightful. I love Benedict XVI very much, he needs our prayers and affection. As Christians, it amazes both my wife and I, that so many Protestants are ignorant of the fact that Catholics are Christians, too ! For instance, many Protestants do not realize, the Baptist Faith, originated right here in America.., around 200 years ago. That John Wesley, as a Missionary, boated the Atlantic, to bring Christ and the Methodist Faith to Native Americans and anyone else on this continent, who would listen. That, no Baptist Pastor decided to travel to America as a Missionary and bring Christianity to the Native Americans. Many are unaware that the word, “Catholic,” means, “Universal.” From their pulpits, many Protestant Ministers tell their congregations about the, “Greeks,” who worked so hard for many years and translated the Ancient Texts, into the King James Version, of the Holy Bible. Yet, we have never hears these same Protestant Pastors, tell their congregations that these same, “Greek Translators were Believers in Christ.., Members of the Catholic Faith and the First Church.” We pray daily, for those who are lost, that they will seek Christ, confess their sins and receive His Forgiving Grace and Salvation..